2012 Mission One Ple. Picture credits - Mission. Submit more pictures. 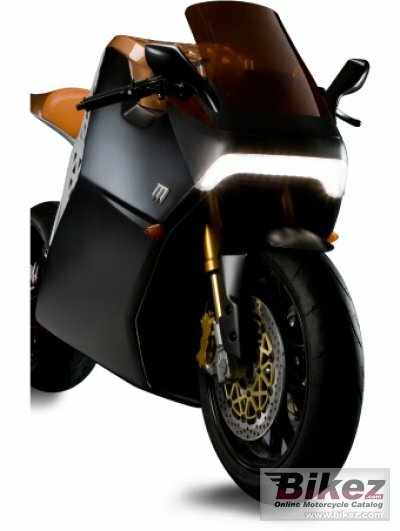 Mission Motors� advanced electric drive system makes the Mission One PLE the first electric sportbike to power wheelie at 70 mph, powering the Mission One PLE to a top speed of 150 mph. The incredible 120 ft/lbs of torque of the 100kW (136 horsepower) AC Induction motor provides otherworldly acceleration across the power band. Rear brakes: Single disc. Bremo. Adjustable regenerative rear wheel braking. Comments: Battery Pack: High Energy Lithium-Ion w/Integrated Thermal Management System. Range: 150 miles per charge (est.EPA) Charging time is 2 hour (220 V). Costs about Dollars 2 to for the electricity to fully recharge the battery pack. Recharge Time: Under 2 Hours @ 240V (8 Hours @ Std 120V). Ask questions Join the 12 Mission One Ple discussion group or the general Mission discussion group. Click here to sell a used 2012 Mission One Ple or advertise any other MC for sale. You can list all available Mission One Ple bikes and also sign up for e-mail notification when such motorcycles are advertised in the future. Ads with or without pictures are easy to create. Our classifieds are completely free with sections for every country in the world. You can also check out our list of related motorbikes. Compare technical data. Look at photos. View your fellow riders' rating of the bike's reliability, design, engine performance, accident risk, repair cost, etc.